A summer thunderstorm brought lightning, wind, rain — and a rainbow — to Tooele Valley Monday evening. But a lot more is needed to reverse the Tooele County’s growing drought woes. 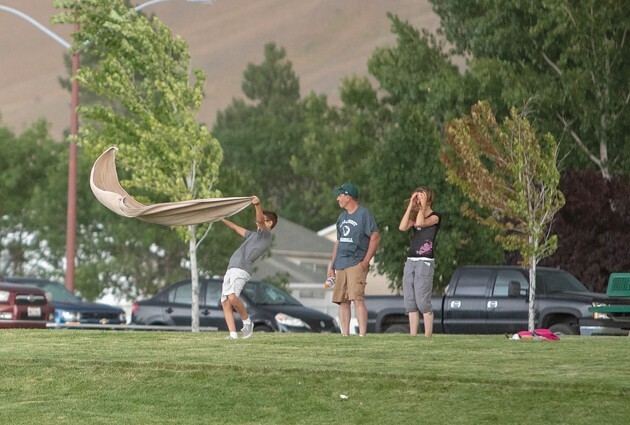 Baseball fans react to strong winds from a quick-moving summer storm Monday evening that brought rain to Tooele Valley. This map of Utah shows current drought levels across the state, including Tooele County. The current water year is a stark contrast from last year’s water totals. Tooele City measured 17.62 inches of precipitation for the 2016-17 water year, about 2.5 inches above normal. But during the past nine months, Tooele City has received only 9.73 inches — almost 5.5 inches below normal. Water years begin on Oct. 1 and end on Sept. 30 of the following year. More contrast is evident at local reservoirs. In spring 2017, both Grantsville and Settlement Canyon reservoirs overflowed and water restrictions weren’t imposed to guarantee water availability throughout the summer and into fall. But this year, both irrigation companies imposed restrictions in June. Tooele County and the West Desert received only 61 percent of normal precipitation for the past nine months, according to the Utah Climate and Water Report published on July 1. The meager water totals have resulted in “severe drought” conditions for the eastern portions of Tooele and Rush valleys. The eastern part of Tooele County regressed to a D2 “severe drought” status three months ago, one step above a D3 “extreme drought” level that most of the county experienced in 2012, 2013 and 2015, according to historical data published by the U.S. Drought Monitor. The U.S. Drought monitor ranks levels of drought as D0 – Abnormally Dry, D1 – Moderate Drought, D2 – Severe Drought, D3 – Extreme Drought and D4 – Exceptional Drought. Three months ago the eastern section of the county regressed to D2 status “severe drought” with the rest of the county at D1 “moderate drought.” Those same conditions exist as of July 3, according to the U.S. Drought Monitor. The U.S. Drought Monitor’s weekly map shows the location and intensity of drought in the United States. It is a collaborative effort of the U.S. Department of Agriculture, National Drought Mitigation Center at the University of Nebraska-Lincoln, the U.S. Department of Commerce and the National Oceanic and Atmospheric Administration. Tooele County experienced “extreme drought” conditions back in March through May of 2015, according to U.S. Drought Monitor data. 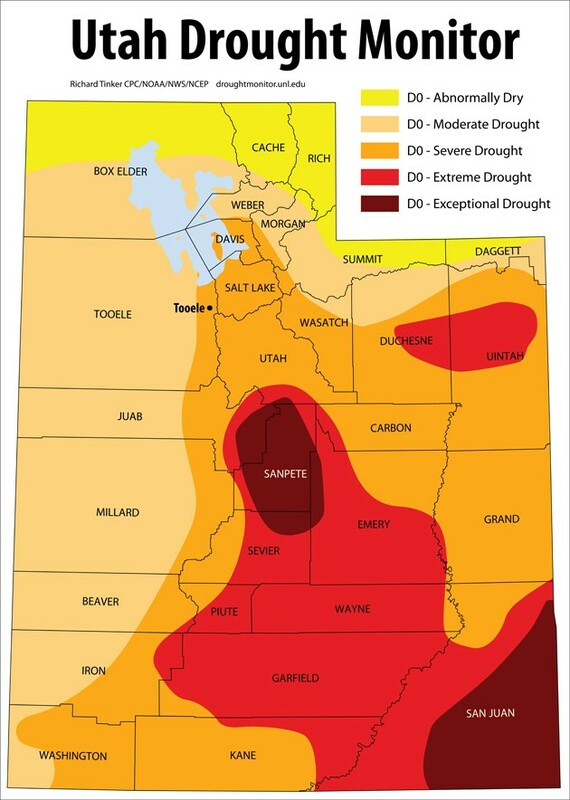 From June 2012 through May 2013, Tooele County was also in an “extreme drought” state. From the start of 2012 through June, 2016, most of the county was in a D2 “severe drought” condition. 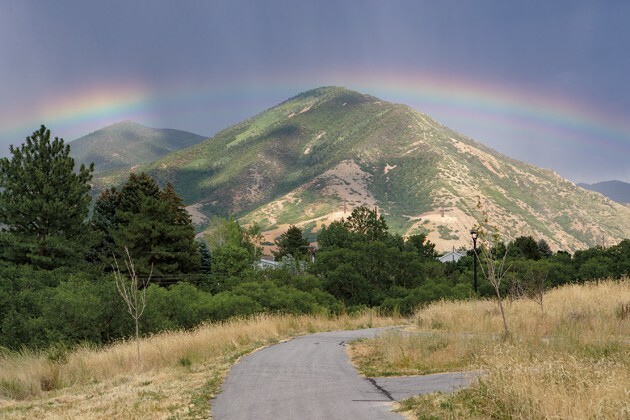 “There was likely no rainfall for the month of June in Tooele Valley,” said Troy Brosten, hydrologist with the Natural Resources Conservation Service. “It’s nice to get summer and fall rain, especially if you don’t have a reservoir to rely on, but the summer precipitation is consumed locally where it falls and will not replenish reservoir levels,” Brosten said. “For reservoir storage the best time to get precipitation is in the winter. The second best is in the spring,” he said. Brosten provided information on Tooele County precipitation from 1980-2010 gathered at Vernon, Rocky Basin and Mining Fork SnoTel sites. Based on the 30-year average (1980-2010) the biggest precipitation month has been March, followed by April, February, and January, according to SnoTel data. Precipitation in Tooele Valley in June 2018 was only 2 percent of average, according to the Utah Climate and Water Report. It brought the seasonal precipitation accumulation (October-June) to 61 percent of average. Soil moisture is at 19 percent compared to 29 percent last year. Reservoir storage is at 53 percent of capacity, compared to 84 percent last year. Tooele Valley and West Desert Basin have been below average precipitation the past nine months. June was the worst at 2 percent of average; followed by October, 2017 at 14 percent of average; November, 2017, 42 percent of average; December, 2017, 49 percent of average; and February, 2018, 62 percent of average. January, March, April and May were above 80 percent of average, but below 90 percent of average. A U.S. Drought Monitor chart explains the various levels of drought conditions.